Local agricultural lender, MidAtlantic Farm Credit, donated $5,000 to Woodbridge High School in Greenwood, Delaware toward the construction of the school’s new poultry house. 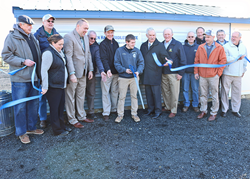 The addition of this new poultry house will help the students at Woodbridge High School, and others in the community, learn about the industry and the many variables that go into raising poultry. MidAtlantic Farm Credit donated $5,000 to the agriculture education program at Woodbridge High School, located in Greenwood, Delaware, toward the construction of the new poultry house. A ribbon cutting ceremony for the new poultry house was held at the high school on February 5. In attendance were: Delaware Secretary of Agriculture Michael T. Scuse, Karen McGrath, representing U.S. Senator Tom Carper’s office, State Senator Brian Pettyjohn, State Representative David Wilson, Farm Credit employees, and students and faculty from the Woodbridge High School’s agriculture program. The poultry house, which measures 10’ x 20’ and contains feed trays and a water line, similar to a commercial poultry house, was built by Warfel Construction. Allen Harim is providing Woodbridge High School with the birds and all feed. The project was co-funded by Eastern Shore Poultry Services, Pep-Up, Inc., Sam Yoder & Son, LLC, 1st State Insulation, A&B Electric, Messick & Grey, T. G. Adams & Sons, Inc, and Warfel Construction. For more information about Woodbridge High School, please visit whsraiders.net.